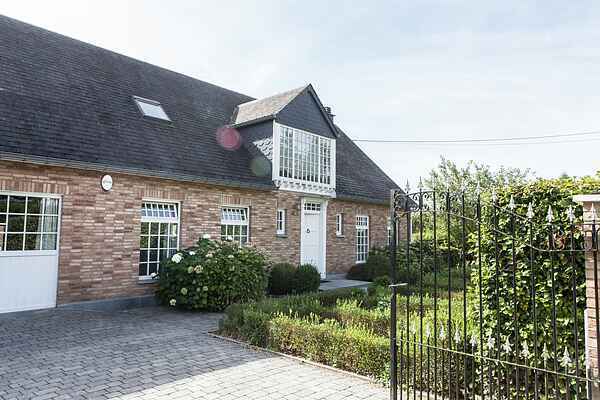 This luxurious vacation villa is situated in a quiet residential area, a few kilometres away from the quaint village of Durbuy. The villa has a spacious design and is supplied with all amenities. There's a big garden, an indoor pool and a sauna. The interior is modern, the living- and dining room are spacious and the sitting area is cosy. There's also a luxurious kitchen and dining table which seats up to 14 persons. The beds, towels and bottles of shower gel will all be ready for you when you arrive at this house, which will immediately give you a feeling of luxury. You can totally relax in the sauna and the indoor pool makes the house very suitable for a stay outside the summer season, too. In the garden, there's a big terrace with barbecue, which offers a great view. The forest, where you can make fantastic walks, is within walking distance and the centre of Septon, where you find a supermarket and other shops, is situated 3 km from the villa. The area is ideally located to discover Durbuy and surroundings. This pleasant town is located just a few kilometres away and Durbuy Adventure and the Barvaux golf course aren't too far either.